Stessl is best known for its small pressed aluminium boats. 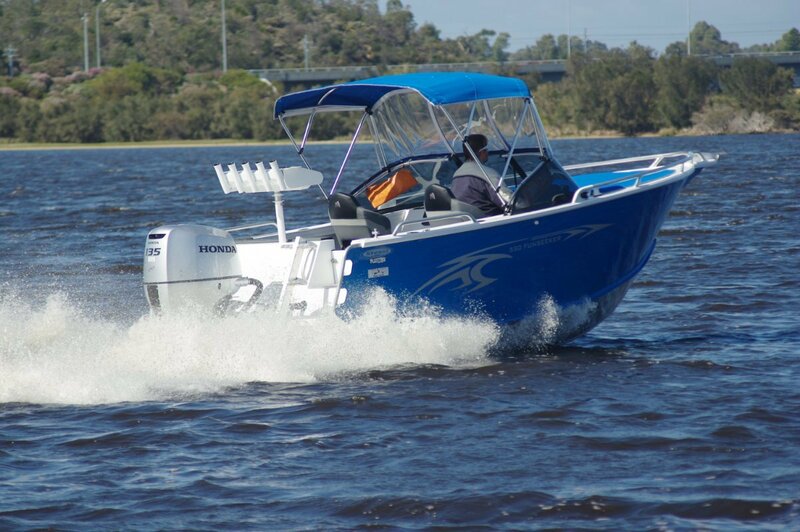 The 550 Funseeker bow rider is large by those standards, and even by the standards of other 5.5 metre boats. A 2.5 metre beam and high freeboard are responsible, although part of the volume is due to a non self draining deck – which is however available as an option. If the boat’s future does not include putting to sea in bad weather, though, those higher sides have much to be said for them, especially with children on board. As well as being bigger the 550 is in plate rather than pressed aluminium; sides, bottom, bulkheads and frames using 4mm high tensile plate. Heavy duty sums up much of this boat: a quality touch is the use of cast cruciform bitts instead of cleats. Bow riders by their nature emphasize seating, and the 550 does it pretty well. The bow compartment is as well served as the triangular space allows, with good upholstery over useful stowage compartments, and thick back rests. The two seats at the twin consoles are excellent armchairs with bolsters, pedestal mounted. The driver’s seat is well positioned relative to the controls; engine monitors and sounder-plotter are mounted above the structural part of the console, closer to the driver’s eye line. Switches and other less urgent items are mounted lower. The comfort continues at the transom with a de luxe lounge curving around the port quarter and across the transom as far as the starboard quarter boarding door. The whole structure is removable for fishing on days of fewer passengers. Centre consoles are the definitive all-purpose day boats, and one of the activities the 550 caters for is skiing. 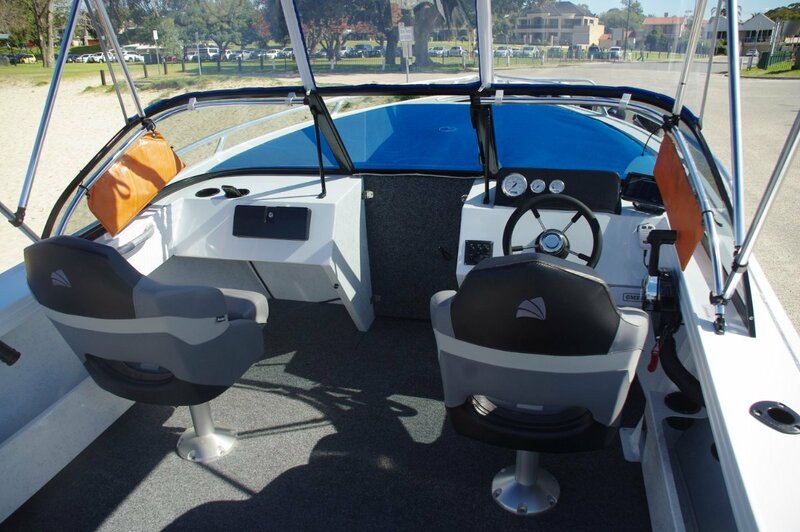 A permanent ski post is mounted above the transom, and the passenger seat alongside the driver swivels for an observer. Illustrating versatility of use a removable bait board with rod sockets sits on top of the post on appropriate occasions. Swimmers and divers have first class water entry and return. Door and platform are serious about their jobs, and the ladder is the genuine scuba article. The 135hp Honda is pod rather than splash well mounted. Besides allowing the near-full width settee, the pod provides lockers within it. One houses the battery (with room for a highly desirable second battery); the other is available for the stuff that did not fit under the bow seats. There is as much stowage on board as anybody other than perhaps my wife could use, with side pockets, glove box and drink holders handling the smaller stuff. The Honda put on a good show: after some experimenting with propellers it topped out at 39 knots. 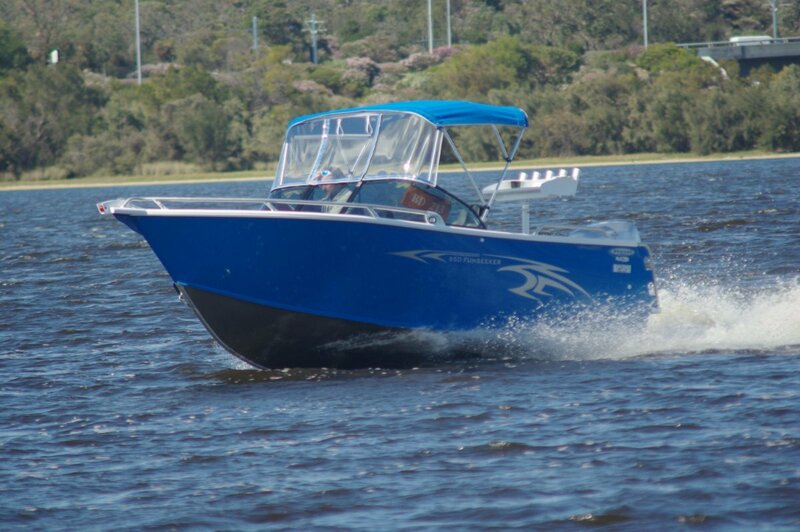 It was the sort of performance this boat’s buyer had been looking for, but it indicated that considerably cheaper power would do the job for many. In the generally smooth water of the review area, interrupted by a few wakes, the hull had little work to do in soaking up bumps. Mind you, at 39 knots small bumps loom large. All was thoroughly soaked up. Stability is good. Two middle weight people posed on gunwales or wandering at random had virtually no effect on the Stessl’s poise. Stessl provide handgrips for the occupants of every seat. Low side rails stretch the length of the boat apart from the vicinity of the consoles. Here the navigator has a personal hand grip; she or he and the driver also have hand rails on the edges of the non opening sections of windscreen. The review boat had two fabric items – a Bimini shading the two first class seats, and a bow cockpit cover. The former will always be welcome, occasionally with its associated clears. I believe the cover has little real use other than protecting from spray any stuff stowed forward. The prime use for bow cockpits is to keep children happy, and they seem to lap up spray. The division between cockpits is spray proof, with a substantial door and windscreen panel doing the trick. Stessls are generally noted for practicality rather than their looks. The Funseeker 550 is an exception. There is practicability in abundance, but this is also a stylish boat with a paint job to match.